What we know about Bronze Age metalworking in Italy basically relies on finished artefacts and on stone, clay or bronze implements involved in the process of manufacturing (tuyères, crucibles, moulds, hammers, chisels, et cetera; Bianchi, 2010; Bianchi, in press). Moreover, evidences of structures for casting are extremely poor, at least in Italy, likely because of a lack of extensive excavations and, in absence of metalworking residuals, the difficulty to clearly distinguish them from other kinds of firing structures (Cavazzuti et al. in press). The reconstruction of the whole technology of production therefore requires a strong effort of making and testing hypotheses, referring not only to autoptic observations on archaeological finds, but also to archaeometrical analysis and study of landscape, in order to identify possible sources of raw materials. In this work our aim is to deepen some aspects concerning archaeologically ‘visible’ (stone mould production and casting), and ‘invisible’ techniques (sword production) of metalworking in Bronze Age Italy, focussing on Terramare context. 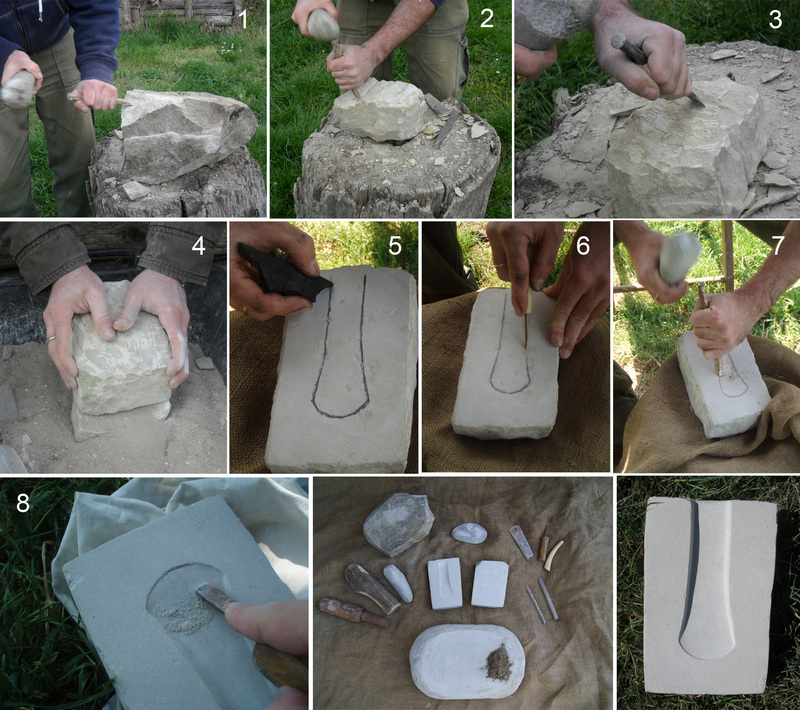 A recent experiment carried out in the Open Air Museum Terramara of Montale also showed that non-expert, non-trained, non-archaeologist people can realise an efficient stone mould for simple objects once they are given essential technical advice about the process. Terramare culture is one of the major features of Middle and Recent Bronze Age Europe (1650-1150 BC), both in terms of the significance and abundance of archaeological remains as well as its geographical position in the middle of the Po river valley. The Terramare area can be considered the joining belt between Central Europe (especially the Danube-Carpathian Basin) and the Mediterranean world, from a geographical and cultural perspective (for an exhaustive frame of Terramare culture, see Cardarelli 2010, 449-455; Bernabò Brea et al. 1997). Referring to the subject of this article, it is important to point out that Terramare artisans developed a high degree of metal production both in quantitative and qualitative terms. All crafts, not only metalworking, were supported by a flourishing agricultural-based economy. Metal arrived from distant areas via a complex network of traffic, which also guaranteed a supply of exotic goods like amber from the Baltic area and Mycenaean pottery from the Aegean (Cardarelli 2010). Concerning the visible archaeological record, a large number of stone moulds have been found on Terramare sites since the 19th century (for a catalogue, see Le Fèvre-Lehöerff 1992). 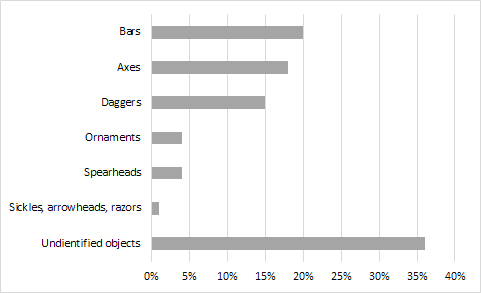 They were used to produce a wide range of bronze objects, such as ornaments, weapons and tools, but the most represented items are bars, axes and daggers (See Figure 1). Fig 1. Frequency of objects in stone moulds (N=96; Modena and Reggio Emilia area). In collaboration with the University of Modena and Reggio Emilia, we studied 96 moulds, or fragments of them, from ten Terramare sites of two regional districts (Modena and Reggio Emilia) in order to understand which types of stone were used by the ancient craftsmen and to find the possible sources of raw material (Barbieri 2006; Barbieri and Lugli 2012). The analysed moulds are made of fine-grained detrital sedimentary rocks (Although not covered in this investigation, other kinds of stone are less frequently documented for the production of casting moulds (metamorphic or magmatic rocks)). For the identification of the rock types we took small samples from the originals, in order to produce thin sections for microscopic analysis. We identified five different groups of lithotypes: the most represented are calcarenite and biocalcarenite. Fine-grained carbonate rocks, the most abundant in the investigated area, have the advantage of being easy to work with and resistant to thermal shock (Barbieri 2006; Barbieri and Lugli 2012). The main geological formations of origin of these lithotypes (Pantano Formation and Monte Cassio Flysch) outcrop a few kilometres away from the nearest terramare settlements. However, the origin of one type of calcarenite, the most common stone used in Modena area, is still unknown. It is possible that this type of stone comes from a small outcrop not detected in our surveys, either exhausted in the past, or that it is not a strictly local stone. As pointed out in the former works, a correlation between rock types and categories of objects carved into moulds does exist. Calcarenite was mainly used to produce moulds for daggers, small bars and ornaments (thin and small objects), while calcareous sandstone was used to produce moulds for big and thick, but also simple, objects, like axes and large bars. The biocalcarenite was instead used for a variety of objects. The selection of these stones could be justified by their availability in nature, the properties of heat resistance and the workability characteristics. Starting from the archaeological record and the petrographic analysis, we decided to reproduce a replica of a Bronze Age mould in order to provide information about skills, knowledge and tools that could be involved in this manufacturing process. As a model, we chose a fragmentary mould for a simple axe from Montale Rangone, one of the best-investigated terramare. The stone mould was found in the oldest 19th century excavations, and can be dated to the middle or recent Bronze Age (1650-1150 BC). The mould is fragmentary but the missing part has been reconstructed on the basis of bronze axes and other axe moulds. Its dimensions are: 11 cm height (the preserved portion), 9.8 cm width, 4.5 cm thickness, while the axe measurements are 9.6 cm preserved height, 4.6 cm maximum width, 1.4 cm maximum depth (See Figure 2). As the archaeological finds seem to suggest, moulds for simple axes were monovalve in this period; we assume that the matrix was covered with a flat, dimensionally congruent, valve. The two valves were then bound together and the pouring metal came from above (Carancini et al. 2001). The stone used is a biocalcarenite of the so-called Pantano Formation. Taking into account the edited geological maps, during an extensive survey campaign we traced out the most accessible source of biocalcarenite of the Pantano Formation on the hills. It is located less than 10 km from Montale. Although it seems to be obvious, it is nevertheless important to remark that a proper block of stone should be chosen in terms of size, shape and texture, in order to reduce the amount of labour and time consumed. The biocalcarenite should be both massive and compact, free from chinks or fractures. We started from an irregularly shaped block of biocalcarenite of about 16 kg, dimensions 35 × 31 × 24 cm, naturally fallen from the outcrop. Sketching out of the block and breaking it into two similar sized pieces. Forming two regular parallelepipeds quite uniform in size with a stone hammer (a river cobble) and a bronze chisel (12% tin). This work requires the greatest care because of the risk of fractures. To reduce the risk of fractures to a minimum, the previous remarks from stone-cut experts (especially points 1 and 2) proved to be very efficient. The majority of waste product was produced in this phase. Working softly on the two surfaces of the valves, gradually decreasing the irregularity with the stone hammer and bronze chisel. Instead of the chisel, a flanged axe was also tested. Thanks to its wide edge, it worked faster and was less invasive on the stone. Scrubbing the two valves one onto each other using coarse dry sand. After a first flattening of the two corresponding surfaces, the chisel did not work precisely enough to make the surfaces satisfactorily smooth. The friction of the sand completely erased the minute residual imperfections. In the end we smoothed the two valves on each other without sand, because the very fine grains produced by the friction were sufficient to refine the surface. Drawing the axe shape onto a valve. A piece of charcoal proved quite useful. Engraving the profile of the shape with a bronze awl. As it has to be submitted to strong muscular pressure, it should be handled properly. Good results can also be obtained by using flint points or flakes. Carving the inside part of the mould with a bronze chisel and a hammer, preferably a wood or antler hammer (stone can be too hard, while a softer material allows more cautious strikes: effectively, the detachment of the splinters follows the profile of the axe matrix (Step 5). Refining the surface of the matrix with a fine handled bronze chisel. Since this represents a first-experience, the entire process required about 20 hours. We can estimate that a time reduction of 30% can be achieved starting from two small, homogeneous sized blocks of stone and skipping the first two steps. Finally the valves weigh approximately 1.8 kg each. Afterwards, the mould was used for some casting experiments. The first one failed: most of the molten bronze drained out through a very small fissure due to a faulty matching of the two valves. That seemed the result of an unsuccessful step 4 and, for this reason, the operation was completed. The second experiment gave a good result. The flat axe was then ready for the hammering and polishing to fully replicate a typical Bronze Age flanged axe. Compared to the visible evidence of stone mould technology, the manufacture of some objects still remains quite unknown. In the Italian Peninsula, hundreds of swords and rapiers have been recovered from settlements, ancient riverbeds or lakes, as well as from hills and mountaintops or burial-places (Bianco Peroni 1970). At the same time, only four stone/clay moulds have been found, but they have to be referred to rapiers (less than 40 cm long) and short swords (less than 50 cm long). 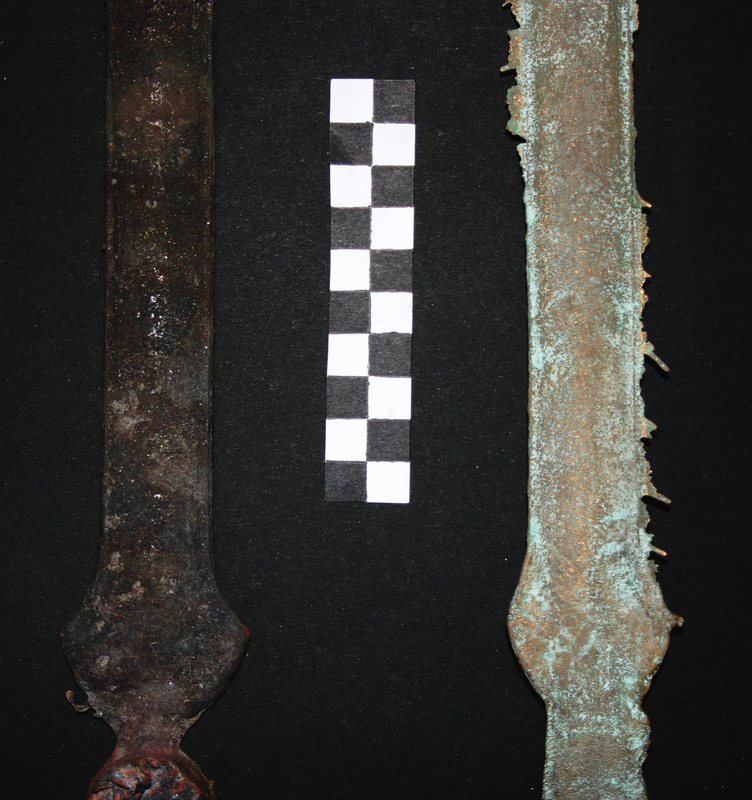 This might suggest that longer swords were cast through alternative techniques, which have not left a visible (or identified?) trace on metallurgical sites, as other authors have already suggested (see Ottaway and Wang 2004). As a first step of the experiment, we tested the efficiency of a sandstone bivalve mould for a long sword. It resulted that the negative of the object carved in the stone tended to lose its detail because of the fragility of the material. The repeated castings of molten bronze in the mould, with the metal temperature exceeding 1300°C, damaged the edge of the blade. Another remarkable aspect was the deformation undergone by the stone, which occurred at the exact moment when it came into contact with the molten metal. The two half valves tended to sag and consequently they did not fit together anymore, so that continuous maintenance was needed. As the second step, we experimented with the possibility of sand casting. Firstly, we produced two wooden clamps and collected calcareous fine sand. The sand should be mixed with some water in order to make it more coherent. Then, the wet sand was pressed in the base clamp with a wooden mallet. A thin layer of dry sand, covering the filling, allows a better re-opening of the valves. After this preparation, a model of the sword was pressed in the sand of the base clamp, and subsequently the upper clamp was put on the lower one and filled again with sand, leaving a hole for casting channel. Finally, the model of the sword was removed, and the clamps were closed again (See Figure 4). After some practices, the casting gave very good results, with no burrs on the edge of the blade. The process of preparing the sand mould has to be repeated every time, and the operations need about 15 minutes. This experience documents that, at least in terms of skills, the stone mould production for axes can be carried out by non-specialised artisans. The entire process, in fact, includes a series of relatively simple operations and muscular energy is not a discriminating factor. Biocalcarenite is very easy to work, even without long apprenticeship or training. Its softness allows small ‘tolerable errors’ during the forming of the valve. The shape of this type of axe is large and simple in design and can be obtained with a monovalve mould, which ignores problems of symmetry. The implements involved in the whole process are few and common, and might be non-specific for this kind of activity (see also Speciale and Zanini 2010, 59). This research suggests that biocalcarenite is a very good material. It is easy to work and, at the same time, resistant to high temperatures and suitable for multiple re-use. We also have to take account of the complexity of the object itself. The flanged axe, typical of Terramare culture does not require big blocks of stone or specific tools to shape the mould, which was mainly monovalve. The lack of minute and/or complicated details in the shape helps preserving the mould from the effects of thermal shock. The same observation can be made about daggers or sickles, as well. As we argued above, the large majority of axe and dagger moulds from terramare are made out of sedimentary rocks, which can facilitate a mass production, thanks to the endurance of the valves. The low skill-degree required for the production of biocalcarenite moulds for axes, however, is not a sufficient proof that it commonly took place at a household level and/or led by non-specialised artisans. We have to consider that our basic level technical experience in stone working is balanced by a deeper scientific (and empiric) knowledge of lithology, petrography, material physics, topography and geological resources. Furthermore, we may suggest that there is a deliberate connection between the type of bronze object and the nature of material used for its moulds, and this may be related to technological choices. It appears to be very likely that casting technologies varied depending on the physical properties of the object (shape, size) and its use. However, we cannot exclude that material technological innovations might, for example, have driven a typological (aesthetic or even functional) change in a particular category of object. Bronze Age swords or other big and/or detailed objects could be produced through alternative techniques such as sand casting. Sand appears a viable alternative: firstly, it is an abundant resource in the landscape of Po valley and a small amount of labour is needed to make the mould; moreover more precise details can be obtained in the blade and, consequently, less work is required to reach the final product. BernabòBrea, M., Cardarelli, A. and Cremaschi, M., 1997. Le Terramare. La più antica civiltà padana, Milano: Electa. Bianco Peroni, V.ed., 1970. Le spade nell’Italia continentale. Munchen: C.H. Beck. Bianchi, P.A.E., 2010. La produzione metallurgica a Beneceto Forno del Gallo (PR). Organizzazione spaziale e produttiva all'inizio del Bronzo Recente. Padusa XLVI, pp.9-36. Cardarelli, A., 2010. The collapse of the terramare culture and growth of new economic and social system during the Late Bronze Age in Italy. Scienze dell’Antichità, 15. pp.449-520. Cierny, J., Degasperi, N., Frontini, P. and Prange, M., 2001. Le attività metallurgiche. In: P. Frontini, ed. 2001. Castellaro del Vhò. Campagne di scavo 1996-1999, Como: New press. pp.57-78. LeFèvre - Lehörff, A., 1992. Les moules de l’age du bronze dans la plaine orientale du Po: vestiges de mise en forme des alliages base cuivre. Padusa XXVIII, pp.132-242. Ottaway, B.S. and Wang, Q.,2004. Casting Experiments and Microstructure of Archaeologically Relevant Bronzes. British Archaeological Records, International Series, 1331. Pellegrini, L. and Scacchetti, F., 2014. Observations on Italian Bronze Age sword production: archaeological record and experimental archaeology. Proceedings from the 7th UK Experimental Archaeology Conference, Cardiff, 11-12 January 2013, EXARC Journal 1/2014.